Christmas, the theatrical season of excess, syncs perfectly with Las Vegas, the theatrical city of extremes. Cue the cocktail waitresses in saucy fur-trimmed minis, monumental snowflakes flaunting their fractals, roasted pheasant stuffed with white truffles, carolers belting out holiday show tunes. Even the Santa sitting in an elegant, out-sized throne at the Fashion Show Mall was the most perfect, iconic Santa I’d ever seen. I almost perched on his knee and ordered an iPhone. Never mind the disconnect between a southern high-desert landscape and a conspicuously high-end northern clime decor. But I was not content to sip my eggnog from a reindeer mug in the 75-degree sunshine while the “Hot Babes” truck glided past. I longed for a little frisson of delight that I used to get when I was a kid and the holidays rolled around and I was sure something wondrous was about to happen. And I got it at the Ethel M Holiday Cactus Lighting. A chocolate factory and a succulent garden are an unlikely combo, even in a city renowned for unlikely combos. Founded by the mastermind who built the Mars, Inc. food giant—one Forest Mars, Sr.—Ethel M is a chocolate brand specializing in small-batch treats held to a maniacally high quality-control standard. No preservatives and plenty of chic gourmet flavor. After bequeathing his confectionery/pet food/par-boiled rice empire to his sons, Mr. Mars moved to Vegas in 1981 and started the company named after his mom on the same site where he indulged another passion: drought-resistant gardening. The result is a small, tour-ready chocolate factory and three acres of tumescent cactus gardens—both are “Mr. Mars” tidy: no stray drip of chocolate, not a rock out of place. The man who branded M&Ms, the Mars Bar and the Milky Way, among hoards of other products, must have enjoyed inspecting the spines of his Pregnant Onion and his Calico Hearts, his Cobweb Houseleek and his Teddy Bear Cholla. But even weirder than the succulent names are their fleshy, suggestive shapes. Their aesthetic beauty ranges from the macabre to the comical as they thrust, poke, prod, spread, point, spear and plop. Morph-wise, succulents are a long way from the archetypal geometry of Christmas fir and pine trees. No cone shapes here. Which is why the annual Ethel M Holiday Cactus Lighting caught me by surprise. I joined a large nighttime crowd—by the time I got there, the only available parking spaces were at the dental school opposite the chocolate factory. We were kept in the dark in the parking lot usually reserved for the phalanx of tour buses while the faint scent of caramel wafted through the air; on the other side of the decorative fence, the desert gardens were black and murky. Zowie Bowie sang “Sleigh bells ring / are you listenin’” while the kids fidgeted. Then the countdown began. It wasn’t the national Blue Spruce on the White House Lawn, but the anticipation was just as compelling: 7, 6, 5, 4…. I still can’t decide if the gulp of awe in the nanosecond of illumination was real or if I imagined it. But there seemed to have been a sliver of time in which we collectively inhaled before the “aw” and “wow,” the sighs and giggles cancelled the “Walking in a Winter Wonderland” theme song. Because it wasn’t a winter wonderland. Far from it. The lights seemed to spring into space, maybe the way the universe did, in some sort of Big Bang of creation. Their placement in the nighttime desert backdrop, the clusters and delineation of twinkles, could never have emerged from the geometry of cones. And they went on and on—lights coiling and uncoiling, spiraling and reaching, in space dense and space empty, as the gates opened and we walked among the succulents as if in a primordial world, and something rang in my heart. 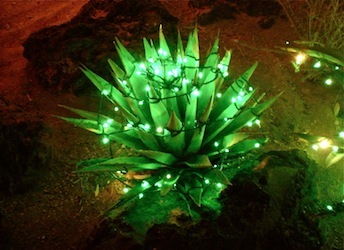 The Ethel M Cactus Gardens are illuminated through January 1, 2012. Free. This entry was posted in Desert and tagged art, Big Bang, Calico Hearts, chocolate, Christmas, cocktails, crowd, culture, desert, eggnog, Ethel M, fashion, fir, fractals, garden, geometry, heart, holidays, Hot Babes, kids, Mars, Mojave, nanosecond, nature, organic, pine, Santa, succulent, Teddy Bear Cholla, twinkles, universe, Vegas, White House. Bookmark the permalink.